Pahan, sure. You run/debug the project with the JDK configured for the project. It can be any version, 1.6, 1.7, 1.8. You can also override the JDK per run/debug configuration. IntelliJ IDEA is very flexible, you can run IDE itself under JDK 1.8, build/run/debug with JDK 1.6 and also have specific run/debug configurations that will run/debug with 1.7 and 1.8. I have found "Use alternative JRE" in f.e. for Junit run, but not for Groovy script. My initial question was about groovy so because that it looks so stupid. Sorry. How I could doing so for run groovy scripts also? You can't do it for Groovy, request is welcome if this feature is required for your project. As this question is offtopic here, please consider contacting support or using YouTrack in case you have any other questions. Thank you. @Serge: so its not possible right now to run idea 14 under java 8 on mac? An Anderl, it's possible, but not recommended with the official 1.8 JDK. You can try 14.1 EAP version with custom JDK which has many bugs fixed. How do I "open" and existing project on intellij 13.1.6 on MAC? it does not show the ij-icon for .iml/.idea folder. it only shows folder that does not tell me if this is correct folder to load project. My JAVA_HOME is set to a Jrockit version. So, I created JDK_HOME and set it to Java 7. But when I click on idea64.exe, it is still trying to search for JAVA_HOME rather than JDK_HOME. (IDEA build 141.177). Try setting IDEA_JDK_64 instead. We have changed the launcher some time ago, so the order/variables may be a bit different. 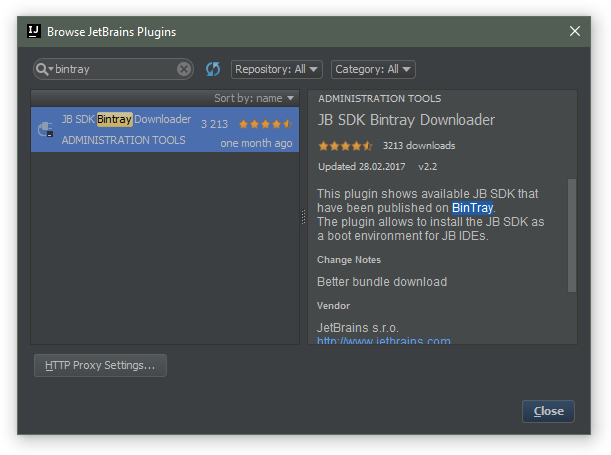 Trying to do this for Webstorm (10.2) 64 bit using the exe vs bat and it still looks @ JAVA_HOME. I have set WEBIDE_JDK, WEBIDE_JDK_64, IDEA_JDK, IDEA_JDK_64 to all point to a specific version of JDK and it stills uses JAVA_HOME as the jdk. My scenario, I have two flavors of jdk installed and JAVA_HOME is set to an older version of JDK. is Oracle JDK 1.7 still the recommended version for Linux? Or is it safe to switch to Oracle 1.8, or God forbid, OpenJDK? You can use 1.8 Oracle JDK or OpenJDK on Linux. I recently began experiencing system crippling performance under PHPStorm 8.0.3. I am running Ubuntu 15.04 on a 6-core i7 processor with 16GB RAM. When indexing files all processing was assigned to a single CPU, which shot the CPU to 100%. Clearing cache and invalidating cache had no positive affect. I finally tracked this down to an apparent issue related to Java -- perhaps an update that was recently applied, not entirely sure. I had been running Java under the Oracle JDK -- Java(TM) SE Runtime Environment (build 1.8.0_45-b14) Java HotSpot(TM) 64-Bit Server VM (build 25.45-b02, mixed mode). I installed OpenJDK Runtime Environment (IcedTea 2.5.5) (7u79-2.5.5-0ubuntu1) OpenJDK 64-Bit Server VM (build 24.79-b02, mixed mode) and performance is as expected. Most notably, the load of indexing is distributed evenly across all 12 CPUs. Thought I would post this in case it helps others. 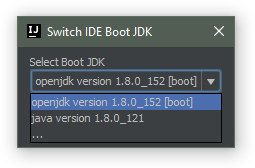 and add the line --> PYCHARM_JDK="/usr/lib/jvm/java-8-oracle/jre"
For reference: I had to change the JVMVersion value in the idea.properties file for it to be recognized by the IDE (Android Studio 1.3). Changing it in the Info.plist file doesn't have any influence with my installation. The above article still states, that Apple JDK 1.6 is required to run your products. However, in the Info.plist of IntelliJ IDEA 14 the key "JVMVersion" is set to "1.6*,1.7+". I am running Mac OS Yosemite and have never installed JDK 1.6. IntelliJ IDEA does not seem to mind and works perfectly. Is the article up to date? Right, MAC USER here. I have a weird issue. I was using PhpStorm 9 and EAP9.5 just fine, then I upgraded to El Capitan (from Yosemite). Usual missing JAVA at startup, fine. This time I chose not to install the legacy Java 6, but Oracle Java 8. Long story short, PhpStorm won't start. I won't detect the JVM even when everything is rightly installed and setup. And, amazingly, not even PhpStorm with the bundled JVM starts! It throws the same message that says there is not suitable JVM! This could help: if I start PhpStorm (even the one with no bundled JVM) as a Guest user on Mac (a user that always has no previous settings for anything), everything works. Any particular setting file or similar that, under my own user, would prevent PhpStorm to detect the JVM correctly? @Vicenzo - I don't know what might cause your problems. Have you tried using the IDEA_JDK environment variable and launching PHPStorm from your terminal. That had to be changed to 1.8. It'd be nice if the IDE wouldn't rely on those settings generated at the time of the first execution (I believe). Doh - typing an underscore triggers italics. Hi Flemming, yes, I had tried that... no joy. I run IDEA 14.1.5 on OS X EI Capitan, and follow the given step to change the JVMVersion from 1.6* to 1.7* .But it doesn't work ,and the error tip is "the intellij idea unable to find a valid JVM" . Actually I hava jdk 1.7 and 1.8 , the JAVA_HOME points to 1.7 version, and the environment variables work well. Frank, if you were using the IDE before the upgrade to El Capitan, please see my comments above. 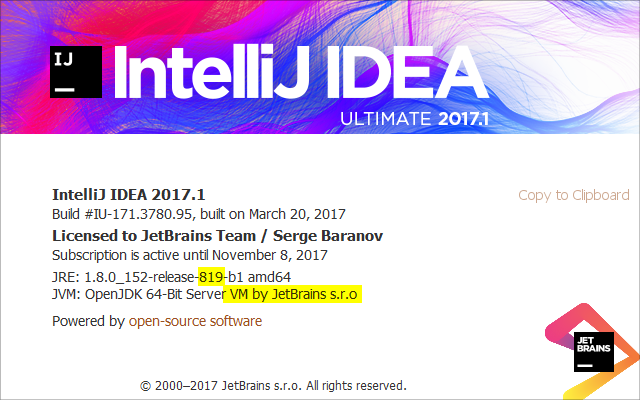 Just use http://download.jetbrains.com/idea/ideaIU-14.1.5-custom-jdk-bundled.dmg . Also, IDEA 15 will come with Java 8 by default (will be released in November). Serge, even the bundled one won't work if you opened the same version (but unbundled) before when using Java6, as ~/Library/Preferences/<Product><Version>/idea.properties would already be written. Frank: I don't find that to be the case. I just changed JVMVersion to 1.8 and it picked up my JDK 8 from Oracle.